Since my parents moved to Texas I am the lone wolf of my immediate family still living on the East Coast. Fortunately, my paternal grandparents, aunts, uncle, and cousins are close by, so I am happily surrounded by family during the holidays even with mommy and daddy so far away. We all gathered at my grandparent’s house Easter Saturday, and I came prepared with this light and fresh Persian Cucumber and Brown Rice Salad. It got along great with rare filet mignon from the grill, baked potatoes, salad, and gorgeously cooked asparagus. Make a boat load of this quick and healthy salad to eat for lunch or dinner throughout the week. It gets better and better as the ingredients mingle. Prepare brown rice according to package directions. On a clean cookie sheet, spread the rice in an even layer to cool down (this also helps to create a fluffy texture). 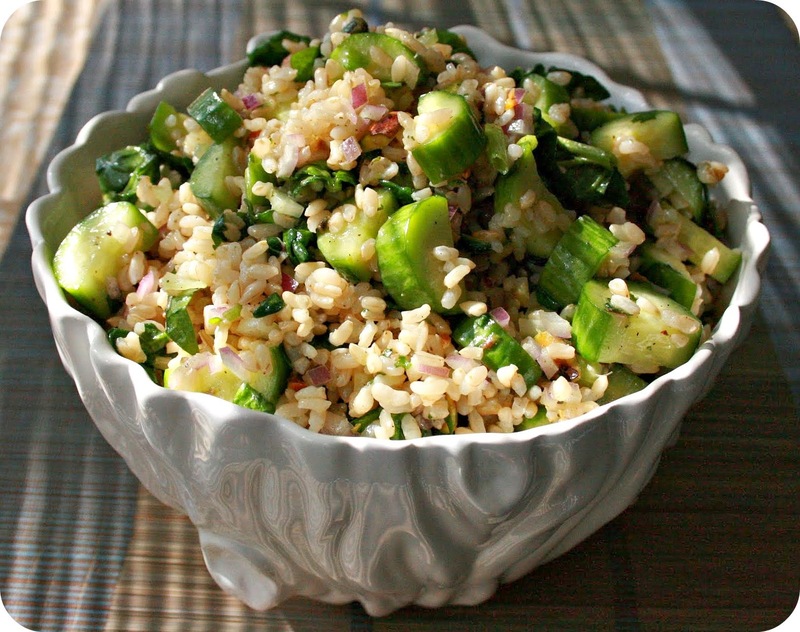 While the rice cools, chop the cucumbers, spinach, mint, tarragon, red onion and toss together with pistachios. In a small bowl, whisk together lemon juice, raw honey, olive oil, grated garlic, cinnamon and a liberal dose of salt and pepper (to taste). Toss all of the ingredients together. The salad can be served chilled or at room temperature. Great to bring to a spring or summer pot luck! I am loving this brown rice salad. All my favorite flavors and brown rice as well. Yum! The pistachios sound amazing in this! Yum! Looks delicious. Don't know that I can find Persian cucumbers here in Thailand, but I'll look! 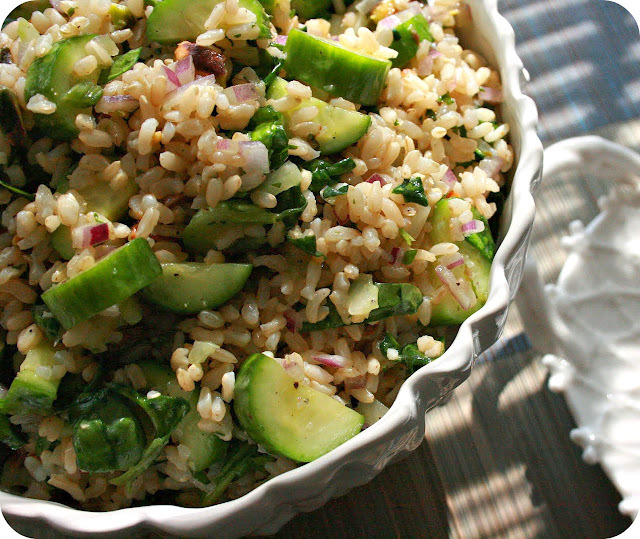 Crunchy cucumber and tender brown rice?!??! This dish is RIGHT up my alley! I love cucumber salads! The ingredients list on this one is amazing! Spectacular dish. Have a great weekend! Wow - that looks delicious and I completely agree with your advice to make a large bowl to have during the week! The mixed texture of this salad does make for a great bite. Love the contrast between the rice and cucumber! I really do like all the ingredients you put in this salad, so it is a winner in my book. Delicious creation-yum! This could be one of the most delicious looking cucumber rice salad I have seen in a long time! Yummy! So pretty - the cucumber half moons look great. What a lovely dish to share with your family ! Will be making this. Healthy and great tasty elements too! Great flavors. The cinnamon is a nice touch. This salad sounds so delicious and refreshing! I am loving the addition of the pistachios! So perfect for spring :)! So yummy looking. You know me and pistachios. That looks so superb and makes a healthy meal. Your pics makes the dish so alive and can't stop admiring them. Lovely salad. And tasty looking photos. That is a gorgeous salad! And such a nice healthy alternative to all of the calorie-filled holiday dishes. Mmm this sounds like a delicious salad! I love the use of rice in a cold salad, just makes it seem more substantial - but I'm obsessed with carbs so it's all good for me! Plus this salad is pretty gorgeous! Yum! This would make for an incredible side! Love it. I love those little Persian cucumbers they are crunchy-delicious. I love how you mixed them all up in this salad dish. For a rice lover like me, it's a shame that I have never made salad with rice. This is just brilliant, Kimmi! Oh I cannot wait to try this! Such a great salad both as a side or as a light lunch. Cucumbers are in season now and neighbors are sharing so I think I will whip some up soon! It looks so delicious. I'm thinking about making this recipe tomorrow. Good for my diet plan. Thank you!